This make cycle will focus on multimodal texts, which is interesting since, really, you have been creating multimodal texts all semester via StoryJumper, with the images you’ve added to your writing, and in your posters, videos, and audio files. If you think about it, most texts in the world are multimodal, meaning that they use a variety of modes–image, movement, color, font choices, text, audio, etc– to make meaning. Most newspapers use video or an image alongside the story; webpages rely on image placement, color, banners, links etc. Hard to find a text outside of school that is only text (novels may be the exception, although you can certainly find many novels that play with form, font, image, etc). We will spend time in this cycle composing some playful multimodal texts such as Memes and Gifs and we’ll start to think about how we can be intentional when teaching multimodal writing. Wood Ray has already started us on this path by talking about their work with teaching illustrations, as you’ll read about this week in Appendix F.
By Sunday, Nov 4: Create Make 5! “ …simply imagine an extended series of lessons like those we described, happening over a period of days and weeks, with all of the lessons focused on some big topic of interest to people who write” (105). They also have a chart on page 105-106 that offers some suggestions for unit study based on a distinction between process and product approaches. 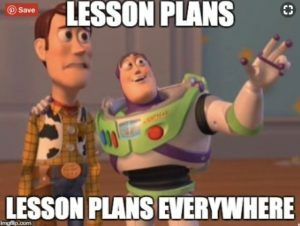 For this prompt, point to some take-aways from chapter 6, especially anything that still seems confusing in terms of how you might plan out lessons for writing over time. Then, take one of the ideas for a focus study (from the chart on 105-106) and start to play with how you might develop a series of lessons or activities based on that idea. For example, what have you learned so far about how you might do a genre study or a study of an author or how to work with illustrations? What mentor texts might you use? What would you ask students to do? This can be really tentative and you might have more questions about how to develop a series of lessons or activities than answers for how to do it, and that’s fine too. What research or next steps would you need to do to be able to write about your plans for students? What would you return to from About the Authors or other books we’ve read? *Our next Make Cycle in two weeks asks you to create a writing assignment, so we’re using this chapter and prompt to start to generate some ideas. If it’s helpful, think about what you might ask students to do over a one week period of time. Since our focus in this Make Cycle is on multimodal composing, let’s make Memes that summarize the ideas from About the Authors (use any of the chapters as inspiration). You can upload/attach the meme image as a photo in your G+ response to chapter 6. In other words, write the response to Part I above, then also include/attach a Meme image in the post. I think we could have fun creating Memes and sharing them with each other. I would use the imgflip site since you can both get information about a meme and make memes. As most of you probably know, memes have their own discourse and patterns to follow. The site will help make you an insider in meme lingo. I’m going to take a different approach this week with the mentor texts and ask you to read an article from Language Arts called “From Homer to Hip-Hop: Teaching Writing through Painting, Performance, and Poetry.” (Language Arts is a journal from the National Council of Teachers of English that focuses on language arts research and teaching for pre-school to middle school.) The article is completely multimodal, weaving a variety of modes and images. The author uses this interesting structure to also describe her class and the ways they used various multimodal approaches in their classroom: from art, to images, to poetry, to drama, to movement, to traditional forms of text. For the response, talk through your take-aways and what it was like to read this article? How was it reading in so many forms? What makes sense and what is challenging while reading this article? How can you imagine teaching multimodal texts? Texts that use image, sound, art, etc? What have you learned about teaching multimodal writing from reading About the Authors (Appendix F comes to mind) and this article? *By the way, you might consider joining NCTE and subscribing to one of the journals such as Language Arts because student memberships are deeply discounted (under $25). Journals are $12.50 per year as a student and $10 per year for online access. Besides Language Arts, I also really like Voices From the Middle. And my favorite journal is probably Journal of Adolescent & Adult Literacy from the International Reading Association. Again, major discounts for student memberships. One of the best things I did as a student was to start my student memberships and start reading current articles in the field of literacy instruction, long before I became a college professor. By Sunday, Nov 4: Make 5! Create a professional “calling card”/website for yourself. This does not have to be perfect, but get started on a web identity that you can use when you look for teaching jobs. Here’s one I recently re-did for myself: http://kimjaxon.com/me I use WordPress and have a domain (kimjaxon.com), but even the free version of WordPress gives you a lot of theme options to play with. You might also consider Wix or Weebly or Google Sites. For this project, you could choose a theme, add an image, write a bio, and consider some pages you might want to include (sample lesson plans? Sample work? Teaching philosophy?). Write a blog post on your new site that reflects on what you’ve learned so far in the course. Write your reflection as a series of meme or gif images. 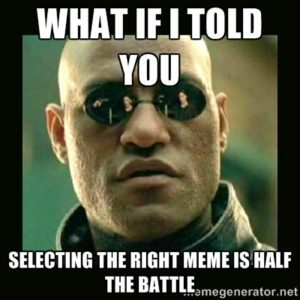 You could embed the series of memes or gifs that you create in a Google Doc as a way to share your reflection. 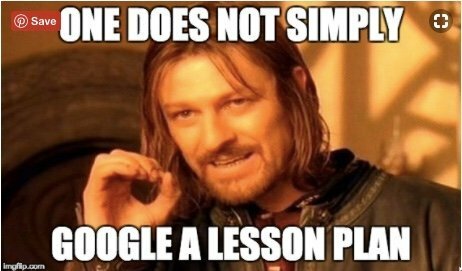 Here’s a blog post from Peter Kittle and me explaining the use of memes from a Make Cycle we did for CLMOOC. And the Giphy site is a great place to create gifs. Make a short video reflection that perhaps adds some visual or text elements in the video itself. By the way, here’s a short documentary about my motorcycle racing mom that might get you excited about making your own video reflection. Create a game based on the ideas in our course so far. What might a board game look like that uses some of the ideas from About the Authors? Another idea you have about how to share a multimodal reflection? Per usual, tell us about your making process: what were you trying to do, what worked, what was challenging…and respond to a peer!